You’ve probably never heard of the Romanian town of Timisoara. There was a Roma girl I knew there once on one of my first trips to the Balkans just after the fall of the Soviet Union. I’m recalling an evening in a friend’s flat in Belgrade. The friend rented out the front room to a Roma family that was selling odds and ends at a local flea market. I had a room off the kitchen to myself. The girl leaned at the door as I wrote in a journal, her mother and grandmother at the stove, filling the apartment with the wonderous scents of grilling meats, sautéing vegetables and a ubiquitous mix of aromatic Balkan spices. The girl was 18, with aspirations of attending dental school one day. Those aspirations were plagued by the tragedy of the Balkans in the wake of the collapse of communism and her Roma heritage, a heritage which evoked acute discrimination across much of Europe, leaving the Roma segregated in a cruel sort of apartheid. Lifting a mug of Timisoarana Beer, a clean and perfectly balanced pale lager, the golden color reminded me of the gold in the girl’s auburn eyes. She’d offered me a bottle of the beer from her home town, part of a stash her father and uncle in the next room had carried as they skirted Serbian customs over small country roads on the frontier between the two nations. Now and then her grandmother would intrude, drawing our hands together with her flour covered frail fingers and e3licit uncomfortable blushes from the girl and I with over-eager talk of marriage. The city of Timisoara itself is a roadmap of the last five centuries of European history, falling to the Ottoman Turks for almost two centuries, became part of the Hapsburg Empire and was all but destroyed during the Second World War. The Timisoarana brewery itself opened in 1718, just two years after Prince Eugene of Savoy forced the Turks to abandon the town, making it among some of the oldest beers in Europe. I like to think the supreme and precise balance of the beer reflects that history, and the ethnic and national influences that washed across southern Europe like successive floods, each laying their own character. The beer takes me back to that night, a chill autumn breeze off the Danube River just across the road, the rattle and bell of the last tram for the night, exotic foods, the beer and her. I was learning, those days. There were too many stories about the Roma in Europe, which carelessly could be affirmed through naïve observation of Roma pickpockets, beggars on trains and upon street corners. Thieves! Criminals! Those were the refrains often heard. I endeavored to fight those misconceptions at every turn, and this good family was the perfect place to begin. And so I am raising this glass of Timisoarana, which is purely and simply crafted and would adhere precisely to the German purity law, the Reinheitsgebot of 1516. In that law, only water, barely and hops were to be used-they didn’t know about yeast in 1516, though they used it. 5%ABV, it poured to a full white head with simple lacing. I like to think that first beer back in 1993 helped to open my mind a bit. I never saw her or the family again, but I sometimes recall those evening’s building bridges of friendship and understanding over a fine bottle of Timisoarana beer. You don’t just get Beer and activism at Revolution and Beer. You get a good story and a bit of history as well. My travels and explorations have always had an element of beer somewhere within those various, sometimes risky and occasionally epic adventures. Beer always held an element of destination, and as a student of history, an indication of place and time as well. I wrote about beer in Sarajevo amid the siege in my memoir, and wove several scenes in my 2011 e-novel “Burn Down the Sky,” over a potent Vietnamese wartime brew called 33 1/3, fermented with formaldehyde in a Saigon café. Trolling the selections at a local Binny’s, looking for something interesting and new for the Beer of the Week, my buddy, CJ, mentioned that he had a couple bottles of a new offering in back. A collaboration between Boulevard Brewing and Sierra Nevada Brewing Company, both of which create consistently good quality beers. This new brew is called Terra Incognita, with a dark mahogany color, reminiscent of Brazil’s perennial Xingu. I poured it into a heavy chalice, one of a dozen (a baker’s dozen until the cat broke one the other night) of those old heavy pub chalices. Terra built a foamy and light chocolaty ¾ inch head that evaporated quickly, leaving minimal lacing behind. I pulled up a couple old photographs and pulled out a worn and dog-eared journal I’d kept. I flipped through the softly yellowing pages, my scribbles and sketches still vibrant as I explored a bottle of Terra Incognita. The 8%ABV helped coax details I’d believed were long forgotten. The taste was sugary and malty, with hardly any hint of hops. The Espresso warmth was tempered in fruity plum and raisin notes. Terra Incognita means unknown land. Certainly that’s what the Balkans were for the Romans and Greeks, but that isn’t what reminded me of Boulevard and Sierra Nevada’s beer, which was modestly priced to compete with any casual bottle of wine. Pausing for dinner the wife and I mulled this beer over a couple of Rib eye steaks, grilled and blackened with a cardamom, cayenne and cumin rub, warmed yellow corn tortillas, homemade black beans fork mashed with fresh cilantro and a bit of mole sauce, and a salad of sliced avocado, fresh jalapeño, tomato wedges, cilantro, red onion and crumbled Queso Fresco with a squeeze of lime. The beer reminded me of one truly amazing moment. There is a place on the mountain overlooking the Sarajevo valley. The city fills the valley below, surrounded by the Dinaric Alps, like frozen green and gray waves upon a stormy sea. It’s a quiet place, the solitude intruded upon now and again by a church bell, the momentary rattle of a tram or the call to prayer from one of the many Mosques that add their spindly texture to the terra cotta rooftops abounding throughout the valley. When the light is just right, mid-summer clouds collecting at the horizon, in which the sun appears to set into the mountains. It is a most magical spectacle, the sunset colors rich and bold. I found something in the lightness of Terra Incognita’s body that reminded me of the breeze coming across the valley as I beheld that rare sight. Make a memory with this beer. Its light enough to enjoy its complexity on a warm summer’s night. Act quickly though, This one is a limited run, and we may not see it again. Bill’s been on the road again in the UP. He got to spend a few moments with Brewer and home brewer Brian Richards at White’s Party Store, 1001 Third Street Marquette Michigan. The talk about home brewing basics, and beer for the warmer months. On June 6th we’ll be previewing our upcoming series on CAN TV. This was a BIGGG project for us, and definitely pushed us outside of our comfort zones again. It has consumed most of our efforts for the last 2 months. We filmed a full season in about a month, and had an absolutely amazing roster of guests. Exhausting? yes. Worth it? HELL YES! So let’s celebrate. Come join us for local craft beer, food, and conversation; because it’s not about the problem, it’s about the solution…and the beer. Please come be a part of our community and have a say in it. The party takes place at the lovely Leadway Bar and Grill, located at 5233 N. Damen Ave. Chicago, IL 60625. “I’m really curious to see what you’ll have to say about this one,” a friend told me, knowing full well I prefer traditional full-bodied beers. I’d recently tried a gluten-free beer and came away wanting. Gluten-free beer does not contain wheat, barley, or rye, so I was a bit reticent to try New Planet’s Gluten Free Blonde Ale and Pale Ale. http://www.newplanetbeer.com/ The previous unnamed GFB simply lacked in depth and character. Things didn’t bode well for the anticipated New Planet experience. Still, we are all about the activism at Revolution and Beer. I resolved that if the beer itself was disappointing, the cause was noble enough. New Planet is a champion for suffers of Celiac’s Disease, which causes the immune system of suffers to, in the presence of Gluten, attack and damage the small intestine, inhibiting the absorption of crucial nutrients. Not exactly a Light beer commercial. But here’s the amazing part, the moment when activism and beer meet is absolutely perfect. We had that experience a number of times while filming our upcoming television series. Folks who had done lots of media previously sat down at the bar, took a drink of beer and found how revolutionary a forum it was. There is nothing so personal and intimate as sitting at the bar with friends, new and old, and hashing things out over a good beer. And when the conversation gets a bit heated, we bring it back to the beer. And so I’m bringing it back to New Planet’s GFB. The trick is in the brewing process, but also appeasing expectations for beer lovers. Without Rye, Wheat and barley, that’s a bit of a challenge. Gluten-free beer is normally made with thick, concentrated syrupy gluten-free sorghum extract. Add a bit of rice syrup or corn dextrose and a brewer can nicely boost the alcohol content. Hops add bitterness, flavor, and aroma to beer. The different varieties of hops brings their own unique characteristic to each beer, offering citrus, fruity, floral, spicy, herbal, or resin notes. Awareness of Celiac’s Disease has helped changed the market, just as designated drivers did for non-alcoholic brews. For the purist, does that translate into an assault on beer? Recall, as we discussed in a previous piece, that technically every beer violates the old German purity law, the Reinheitsgebot, which back in 1516 did not understand the importance of yeast, And so in not including yeast in the officially sanctioned ingredients for beer, all beer violates that law. So no, GFB simply innovates to encompass fellow beer lovers burdened with this disorder. And that’s all well and good, but what does New Planet”s GFBs taste like? That is the ultimate question. And what sort of foods would pair best with this Blonde Ale and Pale Ale? The Pale Ale comes in at a modest 5%ABV, and poured into a pint glass to an amber color with a crisp white ½ inch head, and some modest lacing. The color derived from molasses, and gluten-free corn-based caramel color. The first impression was of fruity and citrus notes, finishing with a comfortably and pleasant hoppy bite, and was a bit on the dry side. I was surprised by the depth of flavor, and found it a satisfying beer, which I would enjoy gluten or no-gluten. 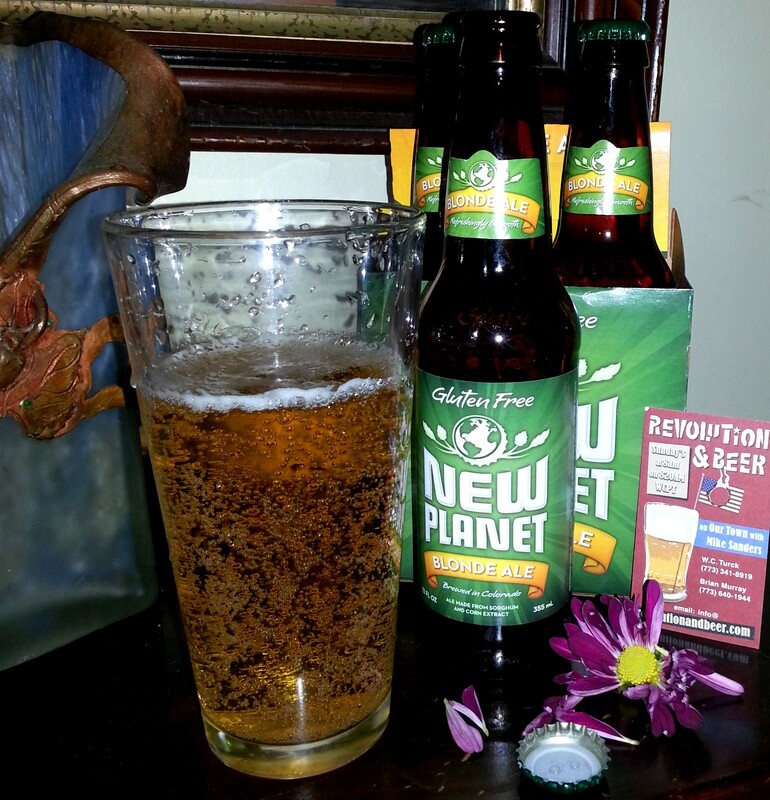 New Planet’s Blonde Ale poured to a clear golden hue, with fine carbonation through the center of the glass. There wasn’t much of a head to note, but the beer did hold its carbonation adequately. My initial impression was that fans of sours would find this a nice beer, falling between a young pilsner and a sour. The aroma was subdued but floral. That slightly sour first taste, was rounded out with hints of orange and honey. Again, at 5%, I found this a very comfortable and enjoyable beer. I’d reached out to Carole Cooper, author of Simply Healthy Gourmet(http://www.simplynaturalgourmet.com/) for a food pairing, in keeping with a gluten-free diet. She recommended grilled Lake Superior Whitefish or Trout and Roasted Rosemary and Garlic Fingerling potatoes which helped the hops, caramel and grapefruit notes to pop nicely. My addition to the fingerling potatoes is to press those potatoes ever so slightly to open them up, and let the olive oil, garlic and rosemary inside. For the Blonde Ale, Carole liked her Virgin Olive oil Poached Tuna steak with roasted small potatoes, tomato and olives. It doesn’t always happen that way, activism and beer coming together so neatly. When it does, it underscores how well those two seemingly disparate worlds fit. And that, my dear friends, is what I like to call the sweet spot. You can find all the great beers we review each week at Louis Glunz Beer Inc.